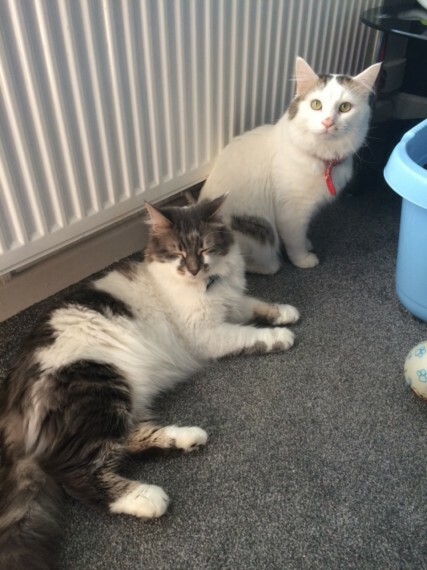 I have two gorgeous boys looking for new homes. through no fault of their own . reluctantly cutting down due to finances . They was born and raised with my children and I. I haven.t put an exact date of birth it.s just an estimate until I find all the pics wiTh dates on. They are brothers from the same litter. the bluey.grey is neutered but the white .spotty is still entire. Mum and dad can both be seen. Very affectionate loving cats. bluey.grey gets all the attention where as the white one is a bit more shy when it.s noisy but comes out for fuss and food when he.s ready. He.s always been the same never been any reason for his shyness or acting scared. They are Turkish vans but unregistered. Inside cats that have only ever ventured out into the garden. The best of homes sought for these very much loved boys. kids are very sad . Price is to secure a good forever home .150 each.